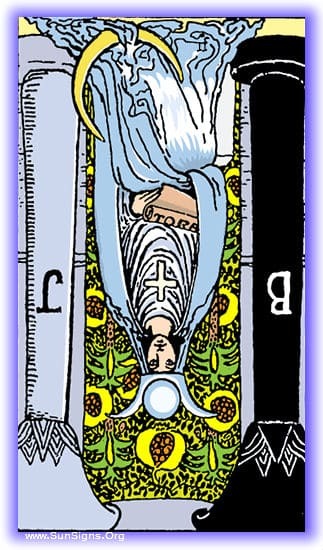 The tone of the High Priestess tarot card meditation in inverted position is a frenetic pointless action and uselessly expended energy and a state of stress. Look at this card blankly. Do you feel drawn towards it, accompanied by a sense of unease and worry? You will find yourself in a chamber, all is at peace there. The people are calmly going about their business, taking care of these details and that little thing. All are relaxed, calm, and happy in their current situation. This is a place that is functioning perfectly, with every member doing their part to keep the situation calm and content. The High Priestess will stand out like a sore thumb here. She is frantically going everywhere, checking on everything and everyone, upsetting them in their place. She is constantly trying to fix things, reorganize them. In some cases it will be the result of a broken vase, which she is trying to fix when the tools are not available to do so. In all things she is active, her hair frazzled, her clothes disheveled, and her hands constantly trying to fix things, make things right, correct them. Take note of her eyes, for her eyes are closed, she sees nothing, she hears no one. If you attempt to speak to her, she will ignore you at best, or rail at you about how she has no time, can’t you see that things are terribly awry? Watching her is your best way to finding the lesson here for you. Follow the frantic creature, or watch the chaos she puts in her wake in an attempt to fix things she has no control over. Note down the results of the Priestess’ actions, for she is her own worst enemy here. Remember that this card’s meaning is frantic pointless activity and constant attempts to control things you cannot.